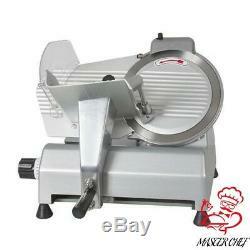 New 10 Blade Commercial Deli Meat Cheese Food Slicer Premium Quality. Heavy-duty 10 Stainless Steel Blade. ON-OFF Switch with Waterproof Cover for Easy Use. Skid Proof Rubber Feet for Table Use. Heavy-duty 240 Watts Motor for Commercial Applications. Convenient to Adjust the Precise Thickness of Meat from 0 to 17mm with the Numerical Scale Knob. This machine is specially designed for commercial use in restaurants, commercial kitchens, butcher shops, delis, farms, and even home use. Its perfect for slicing massive beef, venison, mutton, turkey, cheese, ham, bread, vegetable, fruit and other food up to the 5/8 thick (0-17mm). It slices without breaking down the muscle fiber structure. 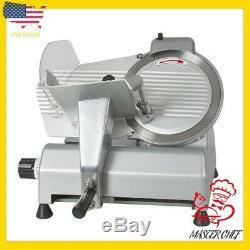 This meat slicer features 240 watts of power, its semiautomatic, made of high-quality stainless steel and is equipped with safe keeping device, which can make smooth precise slicing and work continually. 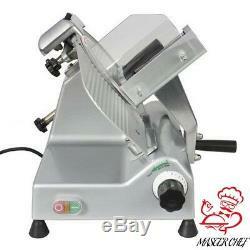 FEATURES:Skid Proof Rubber Feet for Table Use; ON-OFF Switch with Waterproof Cover for Easy Use; Fashion Tilted Design for Fast and Laborsaving Slicing; Heavy-duty 240 Watts Motor for Commercial Applications; Stainless Steel Fixed Device with Steel Nails for Fixing meat to Slice; Fixed Device Handle for Pushing the Fixed Meat to Slice; Heat Output Holes Under the Meat Slicer to Disperse Heat; Big Sliced Meat Exit Behind the Machine for Slice Meat Sliding Out Quickly; Built-in Dual Whetstones for Sharpening Blade Safely and Conveniently; Convenient to Adjust the Precise Thickness of Meat from 0 to 17mm with the Numerical Scale Knob; Numerical Scale Knob Makes the Adjustable Plate to Move Back and Forth and Adjust the Thickness of Meat; Moving Handle and the Fixed Device Handle Compose of Dual Handles System to Slice Meat Effortlessly. 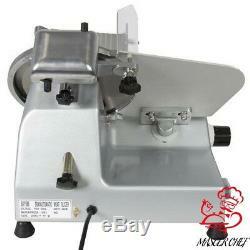 SPECIFICATIONS: CE APPROVED; Character: Semiautomatic; Material: Stainless Steel; Blade Diameter: 10 Inches; Power: 240 Watt 1/3HP; Gross Weight: 49 LBS; Slicing Thickness: 5/8 (0-17 mm); Rated Voltage: 110V 60Hz w/ US Standard Charger; Overall Dimension: (19in X 18-7/10in X 16-1/2in). PACKAGE INCLUDES: (1) Stainless Steel Meat Slicer Machine W/ Dual Whetstones; (1) Instruction Manual. We offer the best prices around on high quality products. Our E-store includes media such as books, movies, music and games while offering electronics, toys, sporting apparel, clothing, tools, general home, garden items and more. We are always working hard to ensure your package arrives as soon as possible. We do not accept P. Please provide a physical address. We try our very best to make sure every customer is completely satisfied. If there's a problem, message us! We're happy to help. The item "10 Blade rival Commercial premium Cheese electric meat Food Slicer chefs choice" is in sale since Sunday, September 16, 2018. 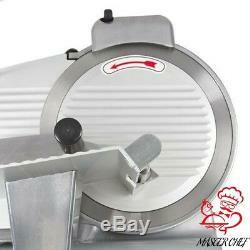 This item is in the category "Home & Garden\Kitchen, Dining & Bar\Small Kitchen Appliances\Slicers & Electric Knives". The seller is "master_chef" and is located in Canton, OH. This item can be shipped to United States.